Over 8,000 people in Tompkins County walk and bike to work and school every day. We were born to walk--and walking helps keep our bodies and minds healthy. While not born to bike, we do a pretty good job of it anyway. Walking and biking are healthy, inexpensive, emit no pollution, burn calories, and are fun! 2. Fix a bike. You can also go to one of these local repair clinics where you can get help fixing up your bike for free. Check their hours beforehand, as these are limited. 4. Choose a route. Depending on your level of comfort, you will want to choose routes that have less car traffic and slower speeds. This biking map provides a sense of relative volumes of traffic on county roads, and this walking map provides some ideas for routes in downtown Ithaca. The Cayuga Waterfront Trail provides car-free travel from Cass to Stewart Parks, going by the West End, Farmers' Market, and Northside/Fall Creek neighborhoods. According to the AAA, the average cost of owning a car is almost $9,000 a year, and about 60 cents per mile driven. Cars with average mileage pollute to the tune of a pound of carbon dioxide per mile. Imagine all you can save even if you switch some car trips to walking and biking. Ithaca Carshare - can give you a car when you need one so you don't have to own it yourself. Reserve it, unlock, and drive - you pay only for time and distance; Carshare covers insurance, fuel, and maintenance. Ever since she was a little girl growing up in the Bronx, Davi Mozie has enjoyed walking. Whether it was walking to and from school, exploring the city, or just spending time with her mom, Davi was always on the move. 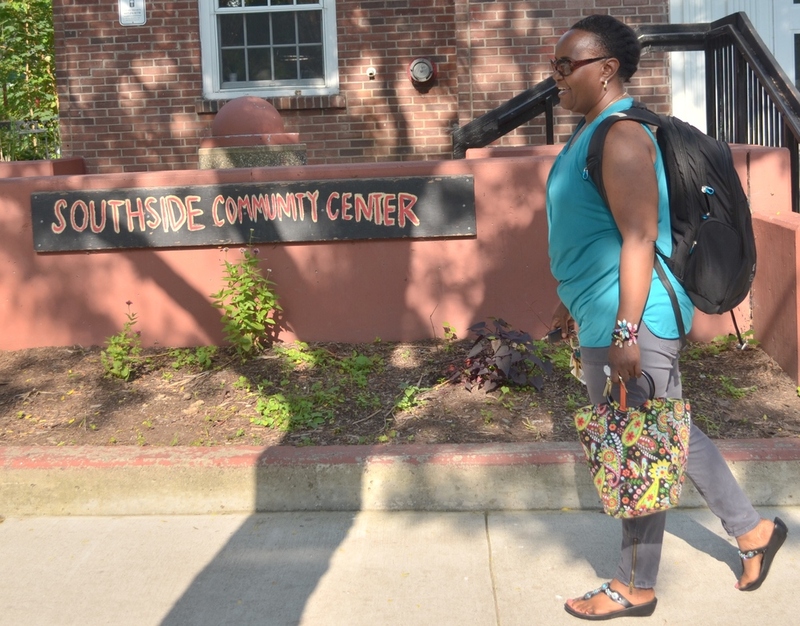 Now, after moving to Ithaca over a year ago and becoming Executive Director of the Southside Community Center, Davi walks more than ever. In Delaware, “I needed a car because I had different meetings to go to,” but in Ithaca, “I rarely fill up my car; the only time I do is when I’m traveling out of town,” she says. Davi estimates that walking has saved her over $1000 in the past year and decreased her carbon footprint by 1.5 tons of CO2 a year. “My original job [in Ithaca] was Creating Healthy Places To Live, Work and Play, so I was thrown into everything about walking,” Davi says. She was also responsible for monitoring some of the trail work happening in downtown Ithaca, which gave her knowledge of many accessible walking trails in the City.